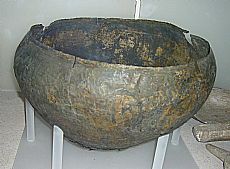 This bronze cauldron was found in a peat bog at Kyleakin on Skye, along with several wooden kegs containing bog butter. The cauldron is quite large, measuring about 18 inches in diameter and 12 inches in depth. It appears to have been hammered out of single sheet of bronze, though has been clumsily patched at the bottom. The rim and handles are missing. The form suggests a date in the first centuries AD for the cauldron. It would have been a high status object, probably used for feasting. Its deposition in a peat bog suggests a final ritual use for the object. Other cauldrons of similar date have been found in bogs or watery areas elsewhere in Scotland, some containing other objects. They are generally thought to be gifts to the gods. One of the kegs with bog butter survives, and the butter within it has been c-14 dated to AD 225-401. Other containers with bog butter, dating from the Iron Age into modern times are known from Scotland and Ireland (see Find of the Month, June 2010). The Kyleakin keg was made of alder. It is 356 mm in height with a maximum diameter of 330 mm. A small carved lug handle is on each side, though no rim handles. The base does not survive, but it originally rested on a ledge cut just inside the lower edge of the body. 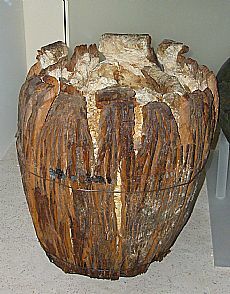 Interestingly, although the Kyleakin keg is roughly contemporary with one found at Morvern, but each has a different way of securing the base, showing different woodworking techniques current at this period. Most bog butter finds are single finds, although intriguingly several may also have been found at nearby Plockton on the mainland. Here, too, only one survives. 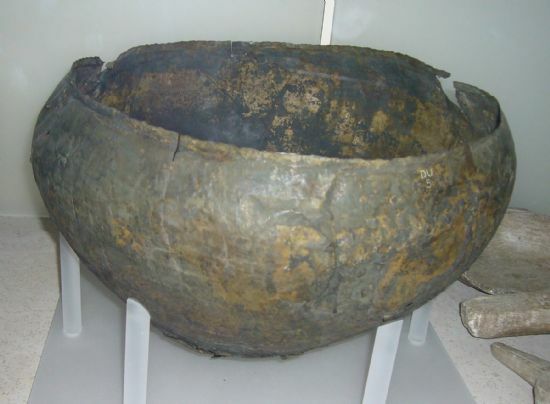 The association of the Kyleakin kegs with a bronze cauldron is unusual, and our best evidence that bog butter may have a ritual use. Even if both were votive deposits it is not clear over how long a period. Other bog butter containers are known from the area, including a now lost example from Kilmaluag, Skye which was said to have been sewn together, the Plockton keg(s), and possibly the keg wrapped in skin from the Point of Sleat referred to in an antiquarian reference. Both objects are on display at the Museum of Scotland in Edinburgh. Anderson, J. 1884-5. ‘Notice of a bronze caldron found with several kegs of butter in a moss near Kyleakin, in Skye; with notes of other caldrons of bronze found in Scotland,’ Proceedings of the Society of Antiquaries of Scotland 19, pp. 309-15. Piggott, Stuart 1952-3. Three metal-work hoards of the Roman period from Southern Scotland,’ Proceedings of the Society of Antiquaries of Scotland 87, pp. 1-50, esp pp.7, 13, 40-1. The cauldron and bog butter were researched as part of the ARCH Southern Skye Community Timeline course. A display of a number of finds from the area will be at Sabhal Mòr Ostaig for May 2012, with all captions in Gaelic. Binders with resources compiled by participants on the course are at Broadford Library and Clan Donald Library.